writes the official BBC Radio 3 blogger about the network's Mendelssohn weekend. The creaky stuff was music by JS Bach, CPE Bach and WF Bach. I know a lot of readers share my own and Isabelle Huppert's passion for the creaky stuff. So I am featuring a newly released CD that has brought me a lot of pleasure. 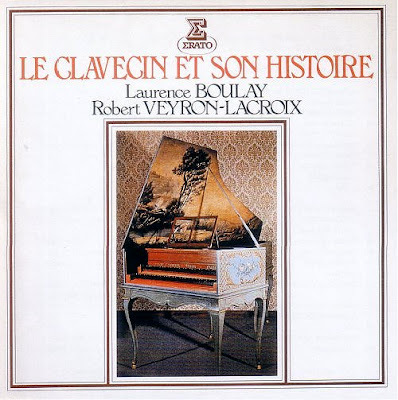 Le Clavecin et Son Histoire is one in a series of re-releases by Warner of classic recordings from the 1980s. The creaks are provided Laurence Boulay and Robert Veyron-Lacroix playing keyboard works by J.S. Bach, Merulo, Frescobaldi, Byrd, Farnaby, Bull, Peerson, Couperin, Pasquini, Dandrieu, Froberger, Rameau, and 20th century composer Maurice Ohana. That last name justifies the price of the CD alone; the work is Ohana's rarely heard eight minute Carillons pour les heures du jour et de la nuit. The good news is that Le Clavecin et Son Histoire and other Erato Originals come at super-budget price; I paid £5.99 in Prelude Records. The bad news is that the presentation of the CDs would seriously embarass a Marrakech pirate. No sleeve notes, plain white label, terrible typography and no artist biographies, although the instruments are identified. Warner Classics really don't seem too keen to sell these CDs as I could find no mention of them on their website. But why should they worry? I am sure they will blame any lack of sales on illegal downloads. No shortage of information on Maurice Ohana though, read more here. Last year's Cannes Palme d'Or winner was Laurent Cantet's wonderful film Entre les murs (The Class) which had no soundtrack music. So no danger of creaky stuff there. Thank you for elucidating the "creaky stuff" reference. I wasn't at all sure what it meant when I read the original post. I thought that blogger only had it in for Handel, but it seems not. By the by, I think that should be Huppert, not Huper. Not to be picky -- it's worth knowing if you want to check her out via a little googling and, God knows, she is worth checking out. Philip, thanks. My spelling mistake entirely, now corrected. Please be as picky (not creaky) as you want. It is peer review that keeps this blog on the straight and narrow.